It's seemed like there's been a perpetual tsunami of hype ever since the first Iron Man movie hit theaters years ago. But the announcements that Marvel made today about its upcoming slate of superhero movies included the names that some fans have been been waiting a long time to hear: Black Panther and Captain Marvel. 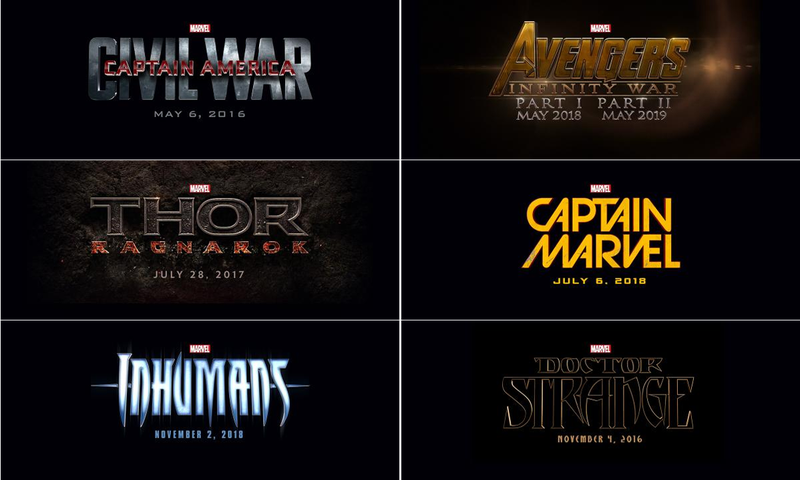 At an event in Hollywood today, Marvel Studios CEO Kevin Feige announced a slate of films that extends all the way to 2019. Some of the movies were productions that folks already knew about, like Guardians of the Galaxy 2 or Captain America: Civil War. But it's the revelation that movies based the Black Panther, Captain Marvel and Inhumans characters that took most folks by surprise. Over the last few years, every time Marvel let a little bit of news out about the future of their film-making efforts, you'd hear grumblings that they needed to diversify their on-screen universe. Getting all those super-powerful white dudes into great movies fulfilled a lot of fans' longtime desires. But some black and female Marvel true believers kept asking when characters that looked like them would be getting the spotlight and stepping out from sidekick roles. Marvel answered those questions today and, in doing so, took a big step to pulling in even more fans into Cineplex seats. I can't pretend to not be excited about the Black Panther announcement. He's been my favorite superhero for a long, long time. The Black Panther is widely regarded as the first black superhero. A creation of chief Marvel Universe architects Stan Lee and Jack Kirby, the Black Panther is T'Challa, the ruler of fictional African country Wakanda. He's the latest in a long line of warrior kings and controls the lion's share of the world's supply of Vibranium, a rare metal that makes up part of Captain America's unbreakable shield. Controlling Vibranium had made Wakanda wealthy and technologically advanced and political intrigue has long been a part of the best Black Panther storylines. T'Challa's been a favorite of mine, not just because he's black but also because he's a man who stands at the crossroads of long-held tradition and cutting-edge modernity, of altruism and ruthlessness. What I'd love to see Marvel do with the Black Panther movie is position T'Challa as the morally opaque strategist seen in Christopher J. Priest's run of the comics. This was a guy who joined the Avengers to spy on them, had to thwart a coup d'etat while in exile and took on Iron Man and shut down his armor, nearly killing him. Show Wakanda as a glittery Afropolitan wonderland at first and then reveal the factional tensions underneath all the perfection. Those tensions will be a nice reflection of the in-fighting scheduled to happen in Captain America: Civil War, where the character will be making his on-screen debut. It'd be the perfect way to present him as, like I wrote a while back, a character who does the right thing in the wrong ways. Speaking of tying things together—with two Infinity War movies also on the way, presumably based in part on space-faring crossovers of the same name—it's a safe bet that Captain Marvel will be involved somehow. There've been a few different people to use the name Captain Marvel in Marvel's comics universe. The movie announced today will almost certainly focus on the current one, an Air-Force-pilot-turned-cosmically-powered-protector named Carol Danvers. Under a long-running tenure by acclaimed Kelly Sue DeConnick, Captain Marvel's a character who's amassed tons of depth. With the ability to absorb and redirect energy and fly unassisted through outer space, she's been the key to repelling several alien invasions and has been on the front lines of major galactic battles. Along the way, she's fought against a near-fatal brain tumor and built up a great, grounded supporting cast back on Earth. Since her superhero origins and adventures involve a lot of dealings with an alien race names the Kree, it's easy to see where her film might allow Marvel's movie continuity to connect events on Earth to developments happening in outer space. It goes without saying that Marvel Studios is a huge money-making machine that's supposed to turn a profit for its investors. But today's announcement feels like it heralds a shift informed by the success of Guardians of the Galaxy, a movie based off a comics property that's never been considered part of Marvel's A-list. With the exception of the sequels to the Marvel Cinematic Universe's big tentpole pillars, these next films will also be mining lesser-known characters. It's been well-documented how pre-existing business deals keep first-tier characters like Spider-Man, the X-Men and the Fantastic Four with other Hollywood studios and out of Marvel's hands. So now is the moment that Marvel is explicitly doubling down on their B-list stable. Like Guardians of the Galaxy, each of these films will need careful shepherding. Though there are probably legions of black and female fans who've been aching to get Black Panther and Captain Marvel movies on the silver screen, Marvel needs to be careful about how they execute on any themes of racial or gendered difference. Leave those out altogether and they'll seem to be out of touch or taking those fan cohorts for granted. Deal with them in heavy-handed fashion and the characters' worlds and possibilities might wind up feeling smaller and more exclusionary. Special focus is going to come down on these projects. Nevertheless, Marvel's taking the risk of changing up their heroic faces a little bit and, as tentative as those moves are, it's a big reason to be excited for the next five years of Marvel movie machinations.